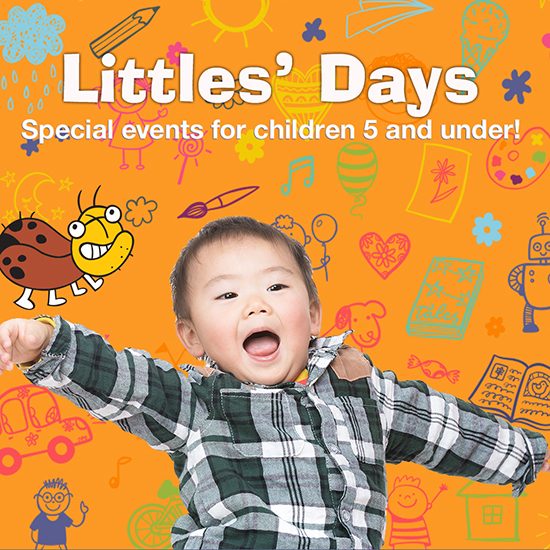 Join us on Saturday, November 10 for Littles’ Day – an entire day of play just for your little one featuring educational, interactive and memorable programs they’ll be dying to come back for! Start your morning by letting your inner artist shine and take home your own masterpiece at Pop-Up Art before heading over to Kindersinger: Kinderfit! to get the energy going! Let your imagination run wild and become anything you wish at Face Painting with Landre SFX, and then grab your spot in PD Presents to learn what circus tricks and science have in common during Circus Science! Explore puzzles and science at STEM Station and then learn about the importance of mindfulness at Magical Mats! 10:00 AM – 12:00 PM: Let the mini artist inside of you shine while you create make-and-take art projects at Pop-Up Art! 11:00 AM & 11:30 AM: Dance around with the whole family during Kindersinger: Kinderfit! 12:00 pm – 1:30PM: Let your imagination soar and become anything you desire at Face Painting with Landre SFX! 1:00 PM: Ever wondered how science and circus tricks are similar? Look no further than Circus Science! Plus, try your hand at some of the circus tricks, too! 1:00 PM & 1:30 PM: Learn about the wonders and benefits of relaxation at Magical Mats! 1:00 PM – 2:00 PM: Explore the worlds of science and technology through interactive games and experiments at STEM Station!